I really enjoy working with copper. The bright shine that starts out and the slow aging of the copper that turns it slightly black. Many of my pendants are placed in Liver of Sulfur (LoS) solution to speed this darkening process. However because I live in a pretty humid area sometimes the tarnish gets a little out of control. For this weaving Wednesday I thought I would show you the difference a little bit of steel wool and a soft brush can make in your pieces. 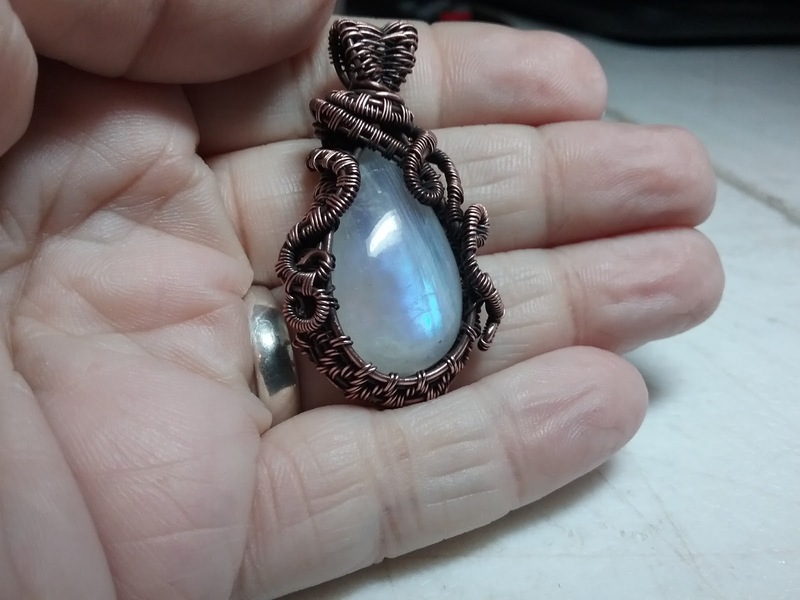 Let's start with the Rainbow Moonstone. This is how the piece looked after I applied my LoS to it. As you can see the weave shows up very nicely around the entire piece. Fast forward about 3-4 months and you can see how significantly darker the piece is. Same lighting, same stone. Just heavy tarnish on the piece. Now here's that same piece after I took a piece of grade #0000 Steel Wool (found usually for working with stains and lacquered finishes). Just brush lightly across the woven areas, trying to shield the stone with your finger. Then follow up with a soft brush. (I use a nail brush) to remove any pieces of the steel wool that might be in there. Some people disagree about using Steel Wool related to rust and so forth. This is the way I do it, please use the method that you feel most comfortable with. I then repeated the process on two other pieces of Larimar. Here's the results. What ever process you use for cleaning the copper, remember to protect the stone from strong abrasives that could scratch the stone or from harmful chemicals that could damage your stone.